Video Mount Products (VMP) is a leading provider of mounting solutions for the A/V, communication and security industries since 1994. VMP products consistently offer the latest designs in safety and flexibility, all at an outstanding value. 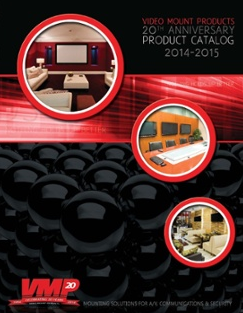 VMP's product offering continues to grow by adding mounting systems to address growing segments across many markets. 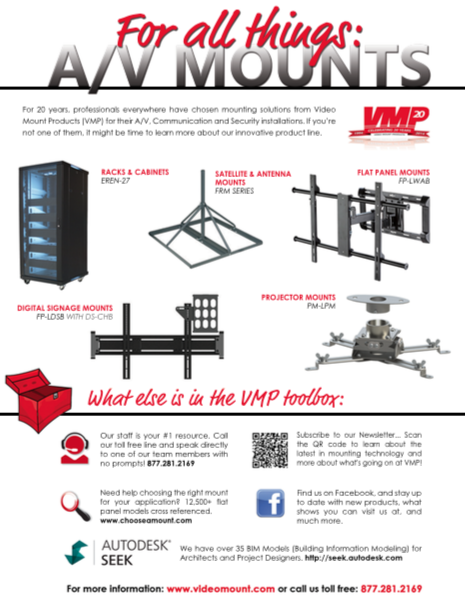 VMP has become the mounting systems company of choice for professionals and their customers everywhere. All products have been engineered for and installed with confidence in thousands of residences, businesses, hotels, restaurants, schools, hospitals, houses of worship and security applications throughout the world. VMP prides itself on providing the best products in the industry and by supporting those products with knowledgeable professionals who understand that "support" is the core of our business. The EREN Series has been designed and engineered for use with a multitude of A/V, Communication and Security components. Fully assembled and welded, these units simplify on-site installation. With a tempered glass front door for great equipment visibility, a double swing rear door for easy access to the back of your equipment and removable side panels, this cabinet makes installing and servicing your equipment simple. With a 1,300 lb. load capacity, the EREN-42E1K is a workhorse you can rely on. Click above to find the perfect mount for your project! Contact your local Accu-Tech representative to learn more about VMP's solutions.